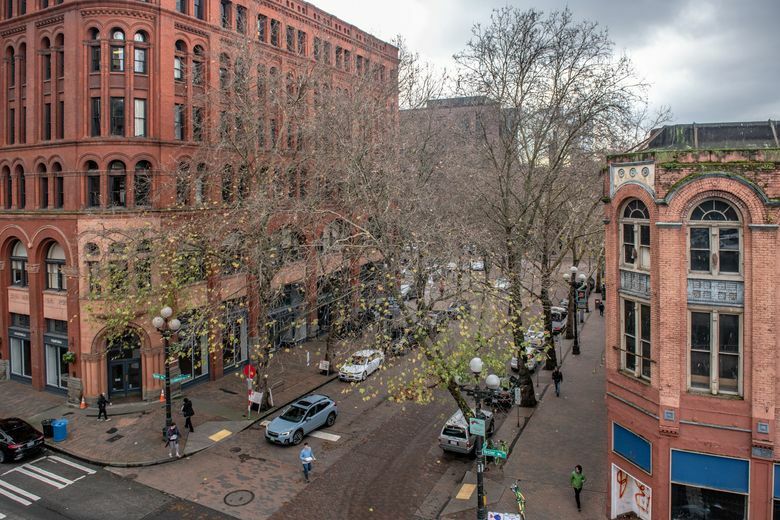 From the top of the Occidental Hotel, pioneer photographer Theodore Peiser captured buildings — some not quite aligned — later lost to Seattle’s 1889 Great Fire. WHEN RON EDGE, one of Seattle’s busy and insatiable heritage explorers, first shared this week’s “Then” photo with me, I was excited and thankful. I have remained so. 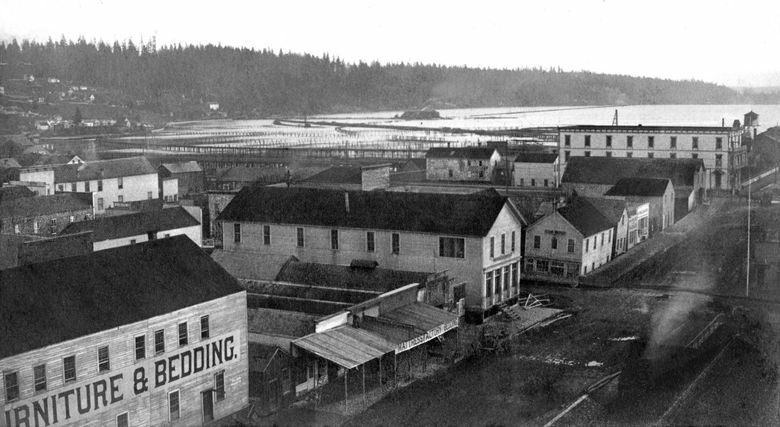 Ron found it among about a dozen other pioneer Theodore Peiser photos from the 1880s that were recently added to the Seattle Public Library’s growing collection of free online photographs. This is a nearly-panoramic glimpse into the Seattle neighborhood that was then a mix of Chinatown and Skid Road. Ron corrected my first hunch that this was photographed from the southwest corner of Occidental Avenue (when it was named Second Avenue) and Mill Street in the mid-1880s, probably late 1884. While my date was at least close to correct, my place was too low. Rather, this was recorded from the top floor, or perhaps roof, of the showpiece Occidental Hotel, which by the time it was enlarged to fill the flatiron block between Second Avenue, James Street and Yesler Way in 1887-88, was only months short of being reduced to rubble during the city’s Great Fire of June 6, 1889. All else showing here (this side of the bay) also was destroyed. Another clue rides on Seattle’s street railway, which started running its horse-drawn cars on Occidental Avenue north from Washington Street in 1888. We can see neither the rails here nor their horsepower. As might be expected, there is an abundance of surviving stories that were “written” to the sides of these streets, including the 1885 expulsion of the Chinese living here. They were pushed out of town by that day’s anti-immigrant populists (we might now call them). We will begin another short story with a question: Does the two-story structure right of center, at the southeast corner of Occidental and Washington (and also the structure beyond it to the south), seem to be leaning to the right? We think so. This was the soggiest part of the pioneer peninsula, named Piner’s Point, after Thomas Piner, a quartermaster on the U.S. Navy’s exploring and surveying Wilkes Expedition of 1841.